My son loves Spiderman, and for his 3rd birthday I made him and his friends this cake to go along with his Spiderman theme birthday party. 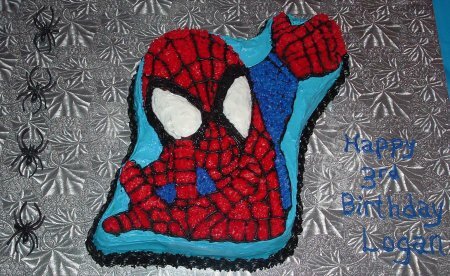 I used the Wilton Spiderman pan and bought the pre-made colored icing from Wilton. I was happily surprised at how good the icing tasted! I just used a regular cake box, the Wilton icing and placed the cake on a store bought silver cake tray. On the tray I was able to write “Happy Birthday” and put store bought toy spiders beside the cake. 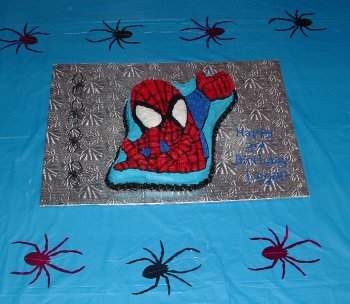 To add an extra Spidy touch, I used spider door hanging decorations on the table to surround the cake. All the kids loved it!